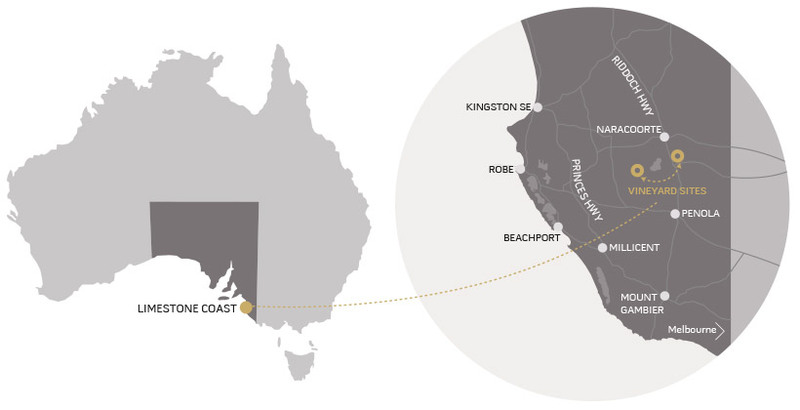 The Limestone Coast of South Australia encompasses the wine areas of the Coonawarra, Padthaway, Mount Benson, Robe, Wrattonbully, Penola, Lucindale and Mt Gambier. The land mass that makes up the Limestone Coast region consists of a number of different soil types. The soils of the district are derived from seabed formations and ancient sand dunes that are friable and free draining and offer excellent physical properties for those interested in intensive farming techniques. The most famous soil type is the 'terra rossa'; small strips of deep red soil over limestone beds, which is ideal for producing top class red and white wines. A predictable cool climate combined with these soils allows for the fruit yield to be of a consistent outstanding quality. The first vineyards in the area were planted in the late 1890's, with major expansion beginning in the 1960's, and then again in the 1990's. Opening in 1998, the winery was the first in the Wrattonbully district. It is located on Caves Road; close to the famous, world heritage listed Naracoorte Caves where Pleistocene fossil bones were discovered in 1859. The ‘Heathfield' vineyards lie 25 kilometres north-west of the Coonawarra township and 24 kilometres south of Naracoorte. In close proximity is Bool Lagoon, a wetland of international significance, being one of the state's largest and home to thousands of species of birds and other wildlife.